We believe character is the core of any superstar. Our camp allows girls to develop self-esteem, confidence, cooperation, fairness of play, and leadership in a safe, structured, and fun environment. We address these areas every day and we teach their importance on a daily basis. Next Level Camp for Girls is being offered at The Ursuline School in New Rochelle, NY and St. Joseph’s HS in Trumbull, CT weekdays from 9:00 am to 4:00 pm. We also offer half day options and flex plans to help families optimize their summer schedules so please call and we can create a program that fits around your schedule. Our playbook is filled with activities that allow your daughter to explore her passions. She will work on her skills on the fields & courts or in the classroom & studio. It’s up to her; we are here to support and help her shine. Take a look at our programs to see the possibilities. Next Level is a Skill-Based Elective Program where girls have an opportunity to create their schedule on a daily basis. 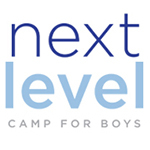 Next Level’s skill-based approach encourages campers of all abilities to pursue their interests and explore new activities in programs customized to each child’s needs. Our program runs weekly, so join us in the weeks that fit your schedule. Our customized program is the perfect balance between structure and choice. Campers feel the encouragement from our staff no matter what day or week it is!